You would like to regularly receive our free newsletters? You have missed an issue or would like to refer back to a past article? Then access our archive. Our detailed overview lists all the important tax dates at a glance. Our MGK Newsletter Health & Taxes is published once a quarter. The newsletter focuses on current tax-related, legal and economic topics for health care professionals. Our MGK Client Newsletter is published eight times a year and provides information regarding current legislation and fiscal trends. 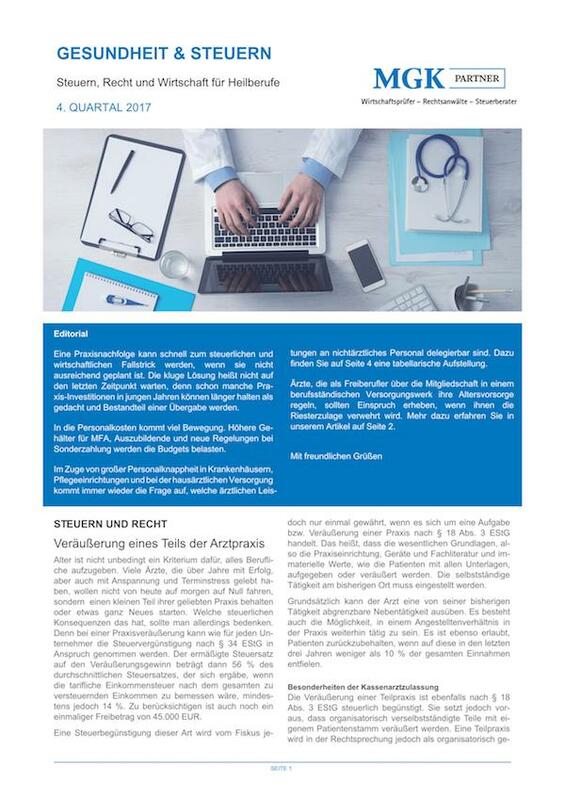 In addition to useful information for all taxpayers, the newsletter addresses topics relevant to employers and employees, to business owners and freelancers, to partnerships, to recipients of capital income, to house owners as well as for shareholders and executive directors of companies with limited liability (GmbH). In addition, the newsletter contains information about international travel costs and about client and company events.